A Wintix user reported that when she went to reserve season tickets today, the seats showed as open on her season ticket seating chart, but they had already been sold to a different patron earlier as a season ticket. To ensure this doesn’t happen, go to File | Initialization | Sale settings. 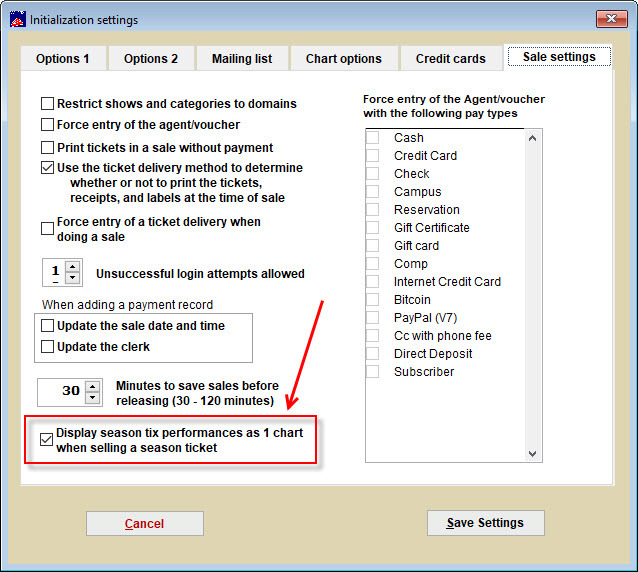 Check the Display season tix performances as 1 chart when selling a season ticket box. Wintix will show which seats have already been sold with the # sign. This entry was posted in Webtix5, Webtix6 and tagged tutorial. Bookmark the permalink.